Continued business growth anticipated for Colorado in upcoming quarters, says CU-Boulder report. With an increase in business filings in Colorado through the first quarter of 2015 -- including new and renewing entities and trade names -- employment in the state is expected to keep growing during the second and third quarters of the year, according to a University of Colorado Boulder report released today by Colorado Secretary of State Wayne Williams. The quarterly indicators report, prepared by CU-Boulder’s Business Research Division at the Leeds School of Business, uses data from the secretary of state’s central business registry. During the first quarter of 2015 a total of 28,115 new businesses formed, up from 26,523 during the same period in 2014. Colorado recorded 103,719 new entities during the 12-month period ending in March, up from 102,127 new entities recorded in the 12-month period ending in December 2014. “Despite a drop in employment in Colorado from February to March, other indicators continue to point to a very healthy economy,” said economist Richard Wobbekind, executive director of CU-Boulder’s Business Research Division. Existing entity renewals spiked in the first quarter of 2015 at a record 126,282, up from 107,848 in the fourth quarter of last year. Domestic limited liability companies represented the greatest increase in renewals among existing entities. The number of Colorado entities in good standing went up in the first quarter to 571,386, a 7 percent increase compared with the same time in 2014. Visit the secretary of state’s website at http://www.sos.state.co.us/pubs/business/quarterlyReports/index.html to view current and past reports or to sign up to receive reports by email. The March jobs report was released for Colorado today, with the preliminary numbers showing a month-over-month decline in employment (-3,900 jobs, -0.2%), and a downward revision to the February estimates. According to data from the Bureau of Labor Statistics, March recorded 67,700 more jobs than the same month in 2013, increasing 2.8% year-over-year. The pace of growth slowed, according to the preliminary March numbers, after growing in excess of 3% for 16 consecutive months. Year-over-year growth in March ranked Colorado 11th nationally, and monthly growth ranked the state 32nd. Average weekly wages increased year over year for the first three quarters of 2014 (4.2%, 2.9%, and 3%, respectively). State per capita personal income increased 3.9% in 2014 to rank 14th nationally, and quarterly personal income rose 5.9% year-over-year in Q4 2014. (MSAs), while monthly growth decreased in three MSAs. Industry growth was recorded in 10 of the 11 industries in the state year-over-year, but growth was only recorded in four industries month-over-month. The velocity of growth slowed in 8 industries. The greatest year-over-year percentage gains were in Construction (10.4%), Mining and Logging (8.9%), and Education and Health Services (4.9%). The weakest sectors for growth included Information (-2.3%), Other Services (0.7%), and Professional and Business Services (1%). Compared to February, the strongest growth came from Financial Activities, Government, and Education and Health Services; the weakest being Mining and Logging, Professional and Business Services, and Other Services. March, but the employment estimates were revised down in February, and continued to lose jobs in March (1.1% month-over-month). The construction industry increased by the greatest pace and absolute number of jobs year-over- year in Colorado, and home prices increased 9% year-over-year in Q4 2014 according to the FHFA home price index. 52% from June 20, 2014. Average weekly natural gas (Henry Hub) prices were down 43% year- over-year in mid-April, and gasoline prices down 36%. The falling oil and gas prices have placed a drag on the oil and gas industry nationally and in Colorado. The Baker-Hughes rig count in Colorado was down 42% in April compared to the same period in 2014, and was down 48% nationally. Evidence of the slowing industry also shows in the employment numbers—the Mining and Logging Sector as a whole lost jobs nationally in January, February, and March, down 29,000 jobs from December (-3.2%). 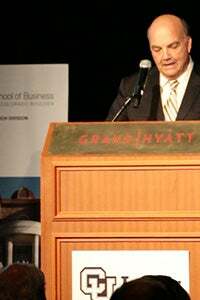 Colorado has recorded two consecutive months of Business Research Division Leeds School of Business University of Colorado Boulder modest employment declines in the sector, as has the Greeley MSA. Monthly drilling permits—a metric that tends to be volatile—decreased year-over-year in March. Of the 42 states with published Mining and Logging employment, only 5 states marked monthly employment growth in March, and 12 recorded year-over-year growth. Colorado 14th nationally. At the low end, Nebraska and North Dakota are ranked 1st and 2nd, at 2.6% and 3.1%, respectively. At the high end, Nevada and Mississippi were ranked 50th and 49th with 7.1% and 6.8% unemployment, respectively. Year-over-year growth (1%) in the Colorado labor force ranked 28th in percentage terms and 22nd in absolute growth. Comparing Colorado job growth to other states, Colorado still remains one of the best recovery states in the nation in terms of employment, ranking 4th nationally for growth above the previous peak, behind only North Dakota, Texas, and Utah. Colorado now measures 6% above 2008 peak employment compared to 2% for the nation. National job growth weakened in March, with the United States adding 126,000 jobs compared to 264,000 in February. The three-month moving average ending in March was 197,000, compared to 193,000 a year ago. Data Source: Bureau of Labor Statistics, CES (Seasonally Adjusted). Despite growth across the state, wide variations persist, with the year-over-year growth recorded in the Greeley (7.2%), Denver-Aurora-Broomfield (3.6%), Pueblo (2.9%), Fort Collins-Loveland (2.8%), Colorado Springs (2%), Boulder (1.7%), and Grand Junction (1.3%) MSAs. Month-over-month growth was recorded in the Fort Collins (0.5%), Colorado Springs (0.3%), Grand Junction (0.2%), and Boulder (0.1%) MSAs. Month-over-month, employment decreased slightly in the Denver-Aurora-Broomfield (-0.2%), Greeley (-0.5%), and Pueblo (-0.7%) MSAs. The April national jobs report will be released May 8, 2015. The April state jobs report will be released May 27, 2015. 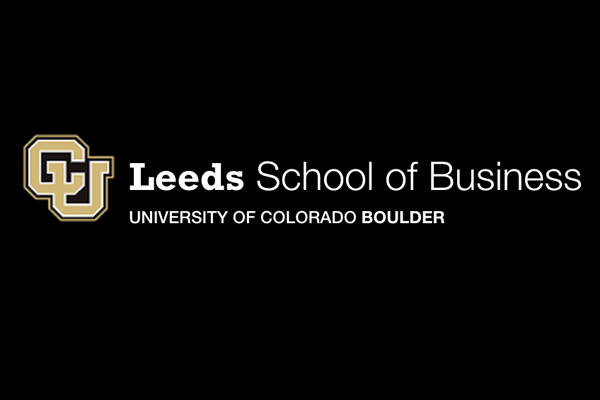 For more publications by the Business Research Division of the Leeds School of Business at CU Boulder, click here. Modern economic growth is driven by innovation and technology. In partnership with the Colorado Business Roundtable, this issue of ICOSA Magazine explores some of these topics in an attempt to inform and inspire leaders here in Colorado and beyond. 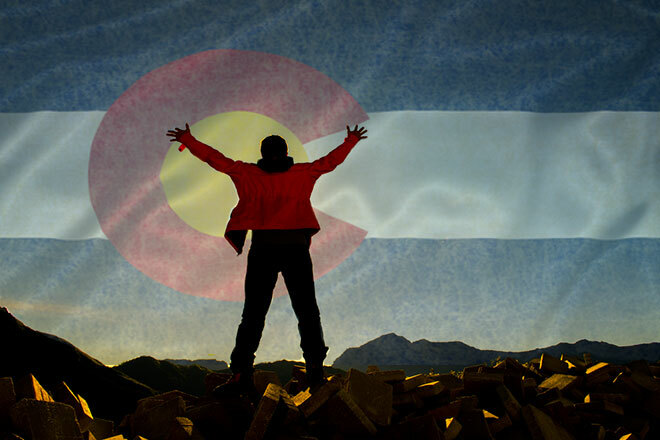 Colorado’s product and service exports totaled approximately $20 billion in 2013. The Excellence in Exporting Award recognizes this contribution to the State’s economy by highlighting one or more firms for noteworthy accomplishments in international business. Colorado-based companies that have exported products or services for three years or more are eligible to apply. Joe Clayton, the president and CEO of Douglas County-based satellite TV company Dish Network Corp., retires at the end of March, and will also leave the Dish's board of directors. Dish Network, founder and chairman Charlie Ergen will be the returning CEO. "Over the last four years, Joe's leadership has been instrumental to Dish as we have worked to engineer a fundamental transformation of our business," Ergen. Wall Street Journal reporter, Shalini Ramachandran, wrote, "Mr. Ergen, the company’s mercurial, 61-year-old founder, stepped away from the CEO role nearly four years ago. As chairman he helped game out Dish’s major strategic moves, including investments to enter the wireless business and a recent plunge into streaming TV. Now, as he assumes day-to-day control once again, Mr. Ergen faces the challenge of capitalizing on those bold bets by finding revenue growth that can counterbalance stagnation in Dish’s core pay-TV business. Dish reported Monday that it lost 79,000 subscribers last year, with 63,000 shed in the fourth quarter as it battled major TV programmers in carriage fee disputes. But in an interview, Mr. Ergen said he views the industry as “relatively in its infancy” and sees a world of wireless-enabled devices beyond tablets and smartphones, from refrigerators to cars to smartwatches  that will “lead to tremendous growth.”"
DENVER – February 5, 2015 – The Metro Denver Economic Development Corporation (Metro Denver EDC) and the Denver Metro Chamber of Commerce presented the 2015 Metro Denver Economic Forecast yesterday at Vectra Bank's 22nd Annual Economic Forecast breakfast. The event took place at the Seawell Grand Ballroom of the Denver Center for the Performing Arts (view presentations and the webcast online). The 2015 Economic Forecast is researched by Patty Silverstein, chief economist for the Metro Denver EDC, and reviews the events of the past several years as well as highlighting emerging trends for this year. The forecast includes national-level information and includes estimates for statewide indicators as well. “Metro Denver will continue to benefit from solid economic performance in 2015. Even as we experience increasing employment and confident consumers, we need to recognize that our aging and retiring baby boomers and well-educated and ready-for-the-workforce millennials are changing the face of our community and influencing housing patterns and how we do business,” said Silverstein. Compared with the national average, Metro Denver's employment growth in 2014 was more than 1.3 percentage points higher at 3.2 percent, which included gains in each supersector except information. Silverstein forecasts job growth in 2015 to be 3 percent, which represents the addition of about 45,000 jobs. According to Silverstein, four supersectors of the regional economy should post strong employment growth in 2015: natural resources & construction (5 percent), education and healthcare services (4.1 percent), professional and business services (4 percent), and leisure and hospitality (3.6 percent). “As the area continues to attract new companies, draw in talented workers, and promote entrepreneurship, Metro Denver will have better-than-average job growth and a lower unemployment rate than the United States and Colorado,” said Silverstein. In fact, robust job growth in 2014 lowered Metro Denver’s unemployment rate in October to 3.6 percent, the lowest rate since October 2007. While unemployment increased slightly since October, the rate remains near historic lows for the region. “With a forecasted average unemployment rate of 4 percent in 2015, our companies can expect to see a very tight labor market,” said Silverstein. Silverstein also highlighted the demographic shifts that are changing the face of Metro Denver’s workforce. She noted that millennials (born between 1981 and 1997) now compose the largest population group in Metro Denver. “While generation X and baby boomers dominate the workforce today, the millennials are making their mark on the workplace and will represent the largest component of the labor force within 10 years,” she explained. Changing demographics not only have implications for future labor force growth patterns and consumer spending, but also residential real estate purchases. The Metro Denver EDC's CEO Tom Clark says that with limited supply in the residential real estate market and above-average population growth, home prices and appreciation are rising and construction activity is picking up. The forecast for Metro Denver includes the seven counties of Adams, Arapahoe, Boulder, Broomfield, Denver, Douglas, and Jefferson. Economic indicators analyzed include: population trends, employment by industry, unemployment, retail sales growth, commercial real estate, and residential activity. About the Metro Denver Economic Development Corporation An affiliate of the Denver Metro Chamber of Commerce, the Metro Denver Economic Development Corporation (Metro Denver EDC) is the nation's first regional economic development entity, bringing together more than 70 cities, counties, and economic development agencies in the nine-county Metro Denver and Northern Colorado area. The Metro Denver EDC focuses on six areas to expand the regional economy: national marketing, new and existing business, mobility, DIA/international flights, tax reform, and special opportunities. 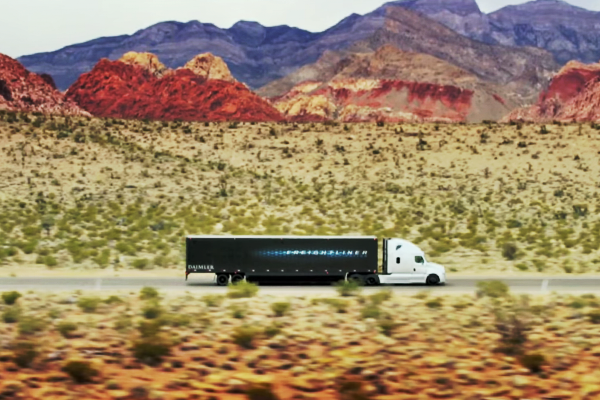 The organization also leads three industry-focused affiliates: the Colorado Energy Coalition, the Colorado Space Coalition, and the Metro Denver Aviation Coalition. To learn more, see www.metrodenver.org. 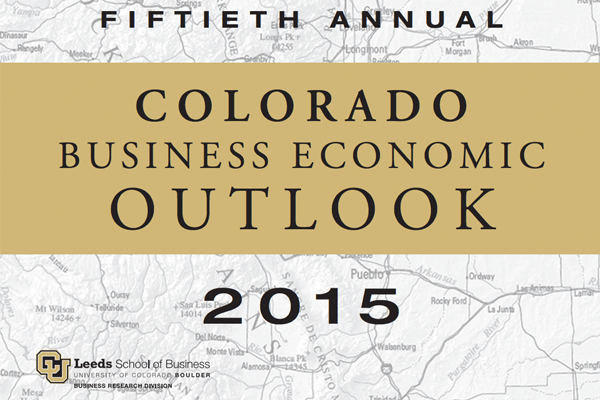 This week, Colorado University's Dr. Richard Wobbekind presented the 2015 Colorado Business Economic Outlook. The Colorado Business Economic Outlook is the longest-running sector-level forecast of the Colorado economy. The forecast analyzes the changes in industry sectors during the past year and looks at the events and activities that will shape changes in population and employment, and in the overall economy for the upcoming year. "Not only is the state's economy solidly in positive territory, but it is ranking in the top five nationally for population growth, employment growth, wage and salary growth and personal income growth," says Wobbekind. Colorado can expect to add 61,300 jobs in 2015. In-migration continues to boost the state's population, while unemployment is falling. The report covers a wide variety, including Agriculture, Natural Resources and Mining, Construction, Manufacturing, Trade, Transportation, and Utilities, Information, Financial Activities, Professional and Business Services, Education and Health Services, Leisure and Hospitality, Government, and International Trade. "With a skilled workforce, a high-tech, diversified economy, relatively low cost of doing business, global economic access and exceptional quality of life, Colorado is poised for both short- and long-term economic growth," Wobbekind said. Check out the full report below or by clicking here. There are few things in this world that need protection as much as a newborn child, and, for the most part, their care and protection fall to the parents. But what happens when the parents themselves need help and protection? Each year 4,000 babies are born to teen moms with 67% of those moms living below the poverty line. Life for these moms isn't easy, with less than 1% of them will ever graduate from college and fewer than half will earn their high school diploma. In Colorado, a single mother must work over 80 hours per week at minimum wage in order to meet the basic needs for her and her child. Luckily for them, there are organizations out there who dedicate themselves to helping and caring for these struggling mothers and their children. Hope House of Colorado is one of these organizations. Through residential programs, GED help and career resources, Hope House strives to be a positive force for change in the lives of teen mothers. 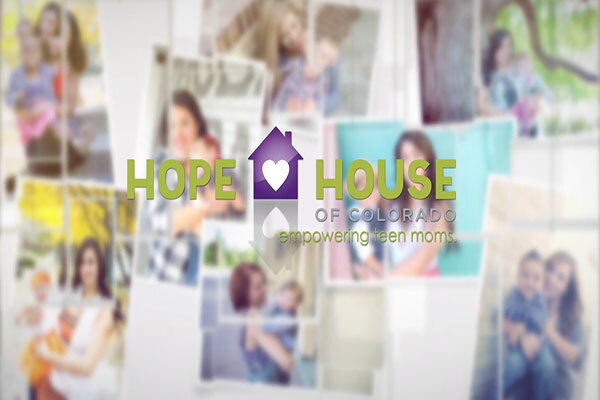 Through Hope House's efforts teen mothers are provided resources to drastically improve their lives and the lives of their children. and thats not all. What really helps set Hope House apart is the amount of support and love that they are able to share. They provide a safe and caring environment to help support those who need it most, mothers and their children. On Thursday, October 30th, The City of Denver and ICOSA Media came together in collaboration in order to strengthen the already booming job market of Denver's tech sector. The event, titled Denver’s Tech Talent: Meeting Tomorrow’s Needs and hosted at the ICOSA Media Event Center, was set up by the Denver Offices of Economic Development to connect those looking for employment with companies seeking talented employees. The day began at 9:00 a.m. when ICOSA Media CEO and founder of the Colorado Business Roundtable, Gayle Dendinger, welcomed all the attendees to the event. Shortly after, tech company CEO's sat down with a representative from the Colorado Technology Association to discuss what drives them to succeed, and how those looking to work in the technology sector could improve their chances of meeting the right company. After the panel discussion, the fair opened up for the public to meet and talk with some of the biggest and fastest growing tech companies in Denver. Special consideration was made for veterans who re-entering the work force, and all were given a chance to get to know a lot of the companies driving the economic success story that is Colorado. A full photo gallery can be found here. Tweets can get you in trouble, if you're Cee Lo Green or any other doofus making idiotic comments... but they can also be a valuable source of information. Who knew that a 140 character social media app would become, not only a first hand reporting medium, but a useful tool for piecing together the aftermath of a natural disaster. This month marks the anniversary of the devastating Colorado floods that wiped out miles of canyon roads and bridges, and significant portions of small mountain towns, including Estes. According to a study by the University of Colorado Boulder, hashtags, and GPS locations attached to pictures sent on Twitter, detailed the scope of damage to the area's infrastructure. What they found on Twitter feeds, helped rescuers and engineers determine where to focus their efforts. And by studying what they learned in the 2013 flood, they can map out a system for effective reconnaissance after future natural disasters. As people tweeted vivid, detailed images of damaged bridges and washed out roads, it was one of the sources of timely information. "After the fact, we compared those tweets to the damage reported by engineering reconnaissance teams and they were all well correlated." explained Shideh Dashiti, an assistant professor of civil, environmental and architectural engineering at CU-Boulder and author of the study. This is critical because engineering reconnaissance crews generally have a narrow window to investigate within the time it's safe to enter a damaged area, and when clean up efforts eliminate the evidence of weakened infrastructure. Those investigations are crucial to to allow for proper repairs, and determine the remaining life of a bridge structure. So, although the practice of tweeting can seem banal or narcissistic, the practice of posting those pictures provides invaluable evidence, which can ultimately save lives. As we are learning in other cases, Twitter as the first draft of history provides evidence that can answer questions that would otherwise be left unanswered. As reported earlier this morning in the Denver Post the Governor's Office of Information Technology announced that David McCurdy will take the post as the new chief technology officer. 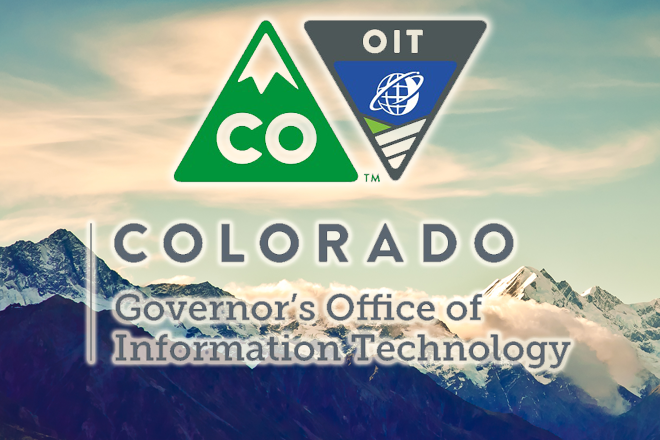 David McCurdy has been named the state of Colorado's new chief technology officer, the Governor's Office of Information Technology announced. McCurdy comes to the post from Arapahoe County-based Catholic Health Initiatives, parent of Colorado's Centura Health hospitals, where he spent 10 years in various positions, including associate vice president and chief enterprise architect, leading a 1,000-person IT staff, OIT said. Overall, he has 17 years of experience as a programmer, system engineer and related fields, OIT said. "McCurdy will continue OIT's critical work of enhancing state IT systems for state agencies and the residents of Colorado," the agency said. He starts Sept. 2, reporting to Suma Nallapati, the cabinet-level secretary of technology and chief information officer. Nallapati was chief technology officer until her promotion in June, and she also previously worked at Catholic Health Initiatives. Kristin Russell, the previous secretary of technology and CIO, announced April 21 she was stepping down to take a job with Deloitte Consulting LLP. Much has been made of the new nutrition requirements associated with the National School Lunch Program which has been in place for two years now. A search of stories and blog posts show musings and manifestos from parents and teachers who have seen pounds upon pounds of food thrown out by students who are required to take certain portions (fruits or vegetables) but won't eat it. Some school officials have pointed to the problem as a source of extreme and unnecessary waste. The underlying problem may be nutrition requirements so specific, that cafeteria kitchens can only meet them with bland, tasteless food results. Which, no matter how you slice it, does no good at all. It's unclear whether that's the reason one Colorado school district is opting out of the national program, regardless of the financial incentive to participate. Weeks before the start of the 2014-2015 school year, the Douglas County School District's board approved a decision to allow the districts nine high schools to drop out of the program. Students who qualify for free or reduced cost school lunches can still participate in the program, but the school district will not be reimbursed by the federal government. The district's figures show that about 6 percent of their students qualify, and the loss in reimbursement would about to $167,000. "We're prepared to absorb those costs," said Brent Craig, the district's director of nutrition services. "We're unique in that way. If I was managing a district with a higher number of free or reduced lunch students, I couldn't do it." Delving deeper, the decision seems to be the result of examining what goes into meeting the NSLP requirements. In one case, the district's chef managed to get a variation of pizza to the recommended 350 calories, but only by replacing the natural cheese with modified food starch, yet it exceeded the maximum allowance of 480 mg sodium. Students didn't like the pizza, but another option, healthier than commercial pizza was well-liked. And that's what the school district would prefer investing their resources in, and ultimately feed to students. To read more about this decision as well as the NSLP requirements, check out this story from the Denver Post or examine the Nutrition Standards. With states finally starting to recover economically, Business Insider decided to take a look at the numbers and see just how each state has grown over the past few years. The metrics used ranged from last years GDP growth, percentage of unemployed citizens, to international exports, housing prices and even auto sales. ICOSA is proud to report that, according to Business Insider, Colorado is number 1 on the list. The list credits Colorado's wide range of industries as well as a 3.8% growth in GDP and an added 66,000 jobs. Colorado came in just ahead of Utah, Arizona, Texas and California. To see how other states ranked, check out the full Business Insider list. A focus on education is paramount for the future of Colorado. Determining the issues of funding, charter schools and curriculum, also determines the success of our state for generations to come. We must do the best we can for students of today, for a better tomorrow. 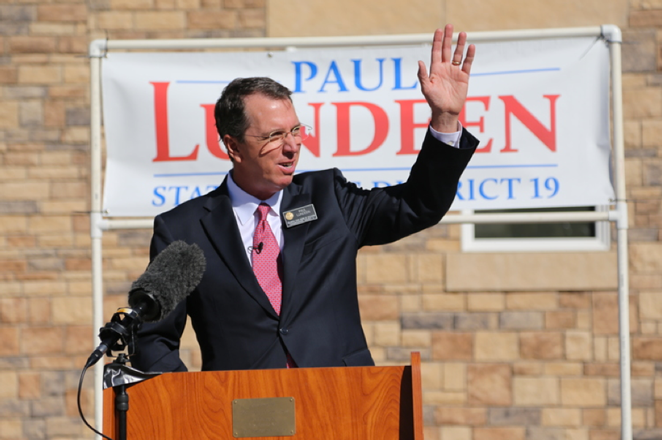 With a real focus on education, we talk with Paul Lundeen, Chairman of the Colorado State Board of Eduction, and unopposed candidate for the Colorado House of Representatives in District 19. Lundeen brings varied experience, as a journalist, to small business owner and years in education to his role in politics. On Saturday's Connect & Collaborate program, we will discuss Lundeen's work to advance the cause of charter schools, and choice in education. He is also an advocate of “Smaller Government, Freer People”, and encourages a free market approach over government bureaucracy. We focus the majority of the show on education issues, so if you want to learn more about Colorado education concerns, tune in Saturday a 1:00PM on KNUS 710 – Please let us know what you think of our program, either by commenting here or on Facebook at Connect & Collaborate with ICOSA or join the discussion on Twitter @ICOSAMagazine.